Festival Spoffin - Spoffin OFF 2017: apply now! Spoffin OFF 2017: apply now! 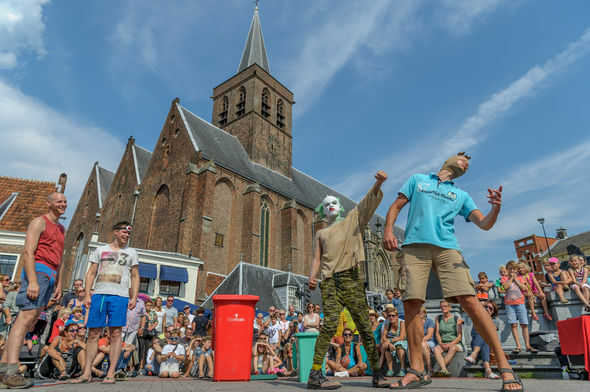 Professional, up-coming street artists and those who want to show new work can apply to participate in the Spoffin OFF program, the showcase part of the Spoffin Festival in Amersfoort (The Netherlands). Spoffin is an annual street arts festival with innovative outdoor and site-specific performances of professional artists from all over Europe, in 2017 to be held from 24th until 27th of August. More then 30 performances are programmed on squares, streets, parks and some specific sites in the mediaeval city centre of Amersfoort. Spoffin facilitates interaction and possibility for meetings amongst performers and professionals both informal and organized. Numerous Spoffin OFF artists have been booked during or after previous editions of the Dutch festival by other festivals throughout Europe. A committee consisting of three festival programmers will thoroughly study all the applications and select a limited number of 15 to 20 artists and groups to participate. The application is open until February 29 and selection will be in March. The first selection will be mainly based upon artistic criteria, like originality, expressiveness, professionalism and whether the work interacts with public space and the audience. Spoffin has a strong preference for productions that are plug-and-play (self-supporting,) can travel easily, use little or no text and offers performing artists open doors performance venue, publicity, meetings with theatre professionals, hotel accommodation, meals and reasonable compensation for travel costs. The international street arts festival in Amersfoort (Netherlands). Every last weekend of August Spoffin offers four days full of theater, dance, circus and music. Sign up for our newsletter and we will keep you updated! You will receive a message from MailChimp to confirm your subscription (opt-in).